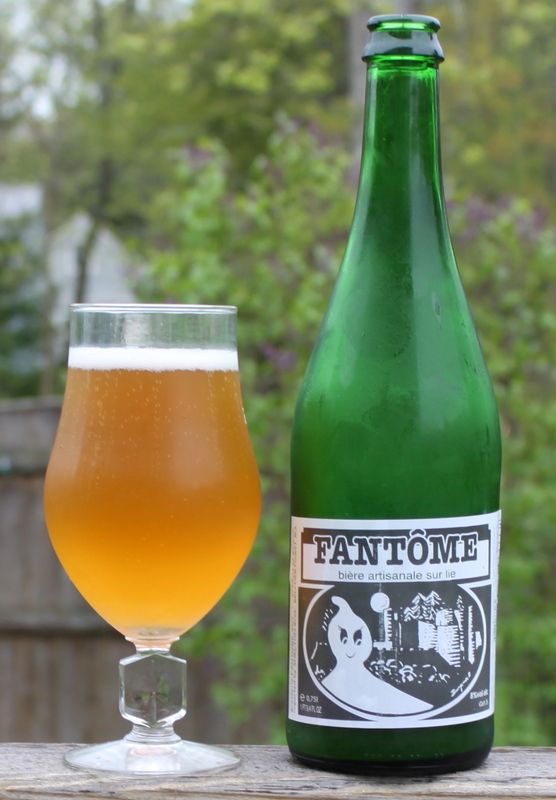 I had a chance a few months ago to try Fantome Printemps, which was one of the best beers I have ever had. I have since had a chance to try a few other beers from this brewery, but just recently got a bottle of their flagship beer, a saison. Tasting — Pours a hazy gold with hints of orange. It is not as carbonated as some of the saisons I have had, the head falls quickly, leaving lacing. A small amount of foam stays on the top, and follows you down the glass. The aroma is very complex, lemony/tart, with an earthy/grassy hop nose, there is some malt at the back. Some mild funkiness comes out, as does some peach. The first sip tastes citrusy and there is some peach in there at first, with some cherry as well. There is a malty sweetness and a tartness from lactic acid that balances it out. The mouthfeel is very smooth, very refreshing. You get the tartness and a touch of sweetness in the aftertaste. Ok, this beer is incredible. It is both sweeter, fruitier, and tarter then I expected. The acidic bite is very pronounced and works very well with the maltiness. The hops are there on the nose, and there is some in the background, but not dominant. I tossed the dregs into a sterile starter I had prepped a few weeks ago. Yes, I am that big of a dork I keep sterilized wort around so I can save the dregs on a moments notice. The lactobacillus in this beer is renowned for being very aggressive, and after tasting this, I can see why. This beer will live on in some future brew…and I gotta get another bottle of this. Try this website for other reviews. Yeah, Beer Advocate is one of the better review sites out there. Handy to pull it up when I am at Lion’s Pride to figure out what I am going to try next.